Over October 21-24, 2014, CASJE convened a virtual conversation: Teaching and Learning Hebrew: Let’s Talk about It. The conversation – in the form of a blogcast – brought together educators, researchers, and funders with a shared interest in Hebrew language education. The goal was to identify ways that applied research could contribute to the development of teaching and learning in this field. 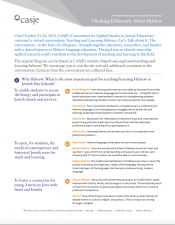 This document was used in the "Thinking Differently About Hebrew" session at the 2015 North American Jewish Day School Conference.